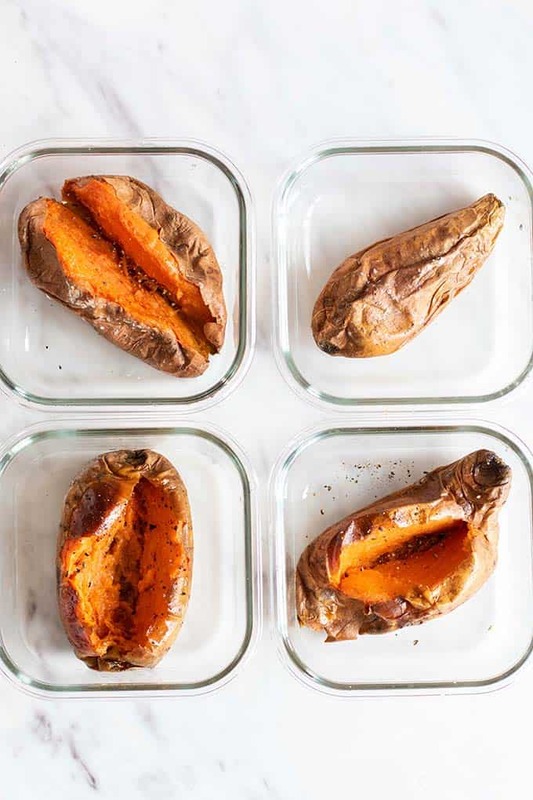 Mastering the perfect baked sweet potato is a great skill for meal prep! 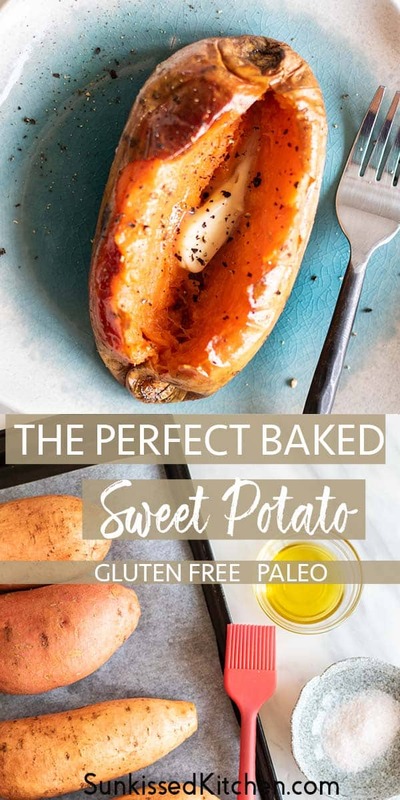 Learn how to bake sweet potatoes in the oven, because they are a great option for building gluten free meals around. Without a doubt, sweet potatoes are a food I can’t live without. They make the perfect canvas for so many meals, and are loaded with tons of vitamin A, vitamin C, iron, and potassium. Sweet potatoes are a great source of fiber, meaning they help keep you full. 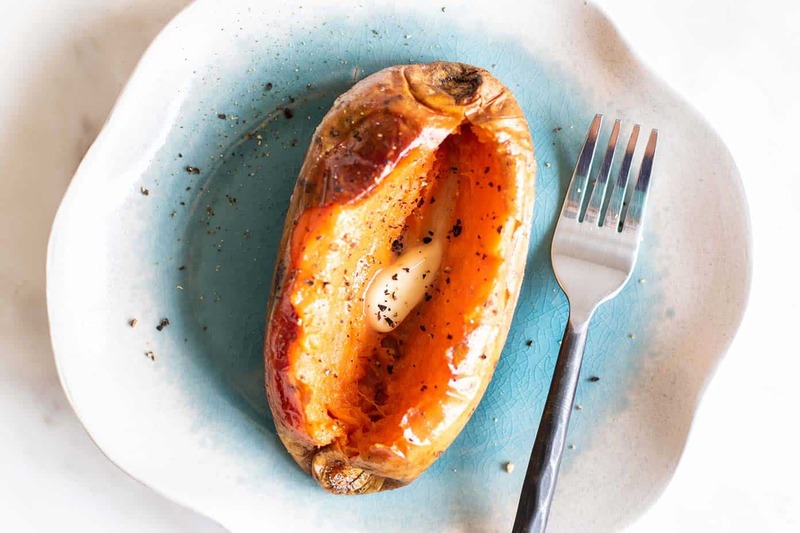 When I want a baked sweet potato, I want one that is baked until ultra-creamy and almost sticky inside. I learned to bake sweet potatoes from my grandma, who bakes them like this on Thanksgiving. I watched her poke at the sweet potatoes, and with patience, hold off dinner, until she was satisfied that they had properly reduced to be sticky-soft inside. 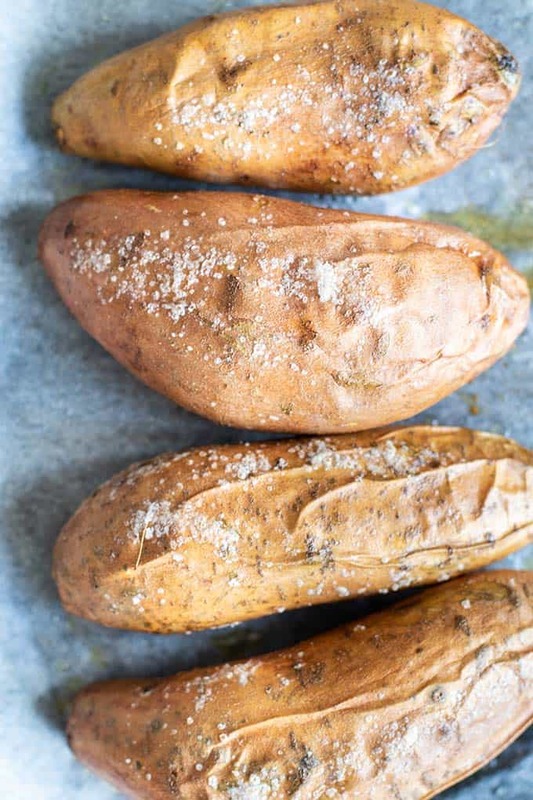 Place them on a baking tray — because the goal here is to get the sugars to “seep” out of the potatoes — not something you want to scrape from the bottom of your oven! 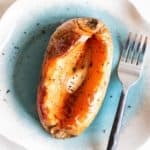 Bake sweet potatoes at 400º F. This temperature is hot enough that they won’t take too long, but cooks them slow enough to really soften and sweeten the flesh. It helps to flip the sweet potatoes halfway through baking to ensure they evening bake. If you forget to flip the sweet potatoes, they will still be delicious! Do a “poke test” to see if they are ready — they should greatly yield to the touch. The skins will “puff up” around the flesh and an air pocket forms around the reduced flesh. This takes a bit of practice! They will start to feel this way about 30 minutes before they are really done. Just be patient, and keep baking them. I like to pull on the skin. If the sweet potatoes are ready, the skin pulls off very easily. When you cut open the sweet potato, you want it to very easily “squish” and come off a fork very creamy. Once your sweet potatoes are ready, serve them for dinner, or pack them in meal prep containers ready for the week’s meals. 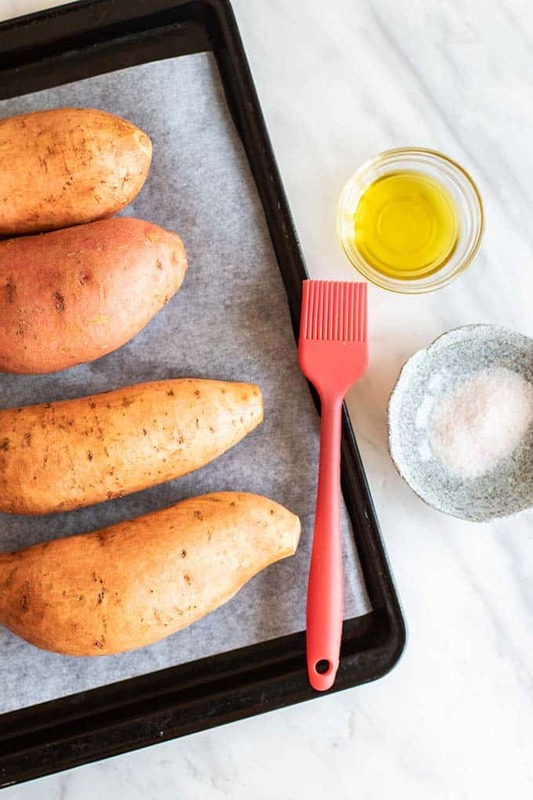 Learn how to make the perfect baked sweet potatoes every time! Sweet potatoes are a great canvas to build so many meals around. Wash sweet potatoes, and brush lightly with olive oil. Sprinkle with salt, to taste. Baked sweet potatoes for 1 hour 20 minutes, or until the flesh has reduced and is very soft. The skin will very easily pull off the potatoes when they are ready. The Perfect Baked Sweet Potato post may contain affiliate links, meaning if you make a purchase, I will receive part of the sale as a commission. This helps me continue to bring you lots of fresh and inspired recipes! 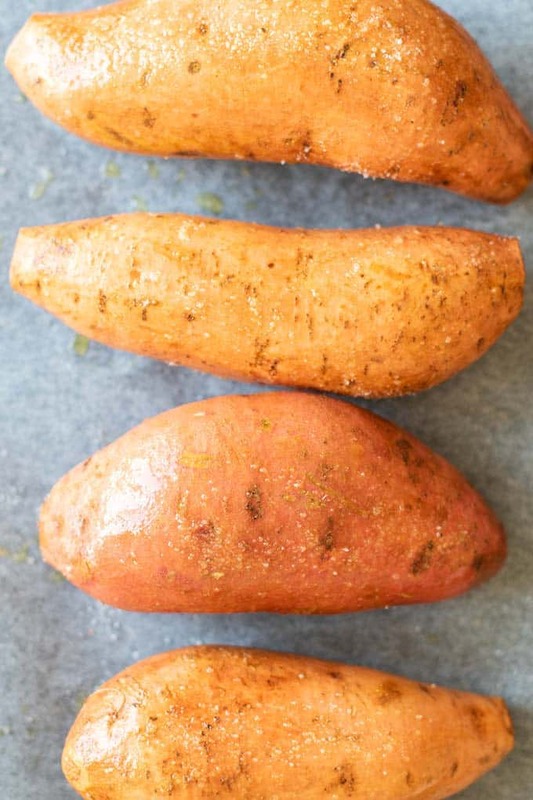 My family is obsessed with sweet potatoes and this is the perfect recipe for baking them! Thank you! Sweet potatoes baked to perfection are so delicious, aren't they? I just made roasted sweet potatoes and I wish I'd had your tips -- especially about roasting on a tray to catch the sugary goo that seeps out... Next time! Your photos are gorgeous!